As we develop the methodologies for making it easier for the children with special circumstances to discover themselves as individuals and to establish bonds with their surroundings, we also look for an answer to the question of how the business model for a social enterprise could be. Out of the programs that we applied for, Change with Business offered a training opportunity that increased our speed. On April 27th-30th, in the Business Model Development Training for Social Entrepreneurs, experts from Koç University Social Impact Forum – KUSIF, Ashoka Turkey, Impact Hub Istanbul, KWORKS and Mikado Consulting shared their knowledge and experiences. For our endeavors out of lean canvas, for the first time, we asked ourselves the question of who our customer is. We worked on developing a methodology apart from sponsorships and individual donators in order to maintain economical sustainability. For the field work about the subject matter, we asked questions on the phone to our initial target group and reached 7 people and we gathered enlightening information out of our notes of those conversations. 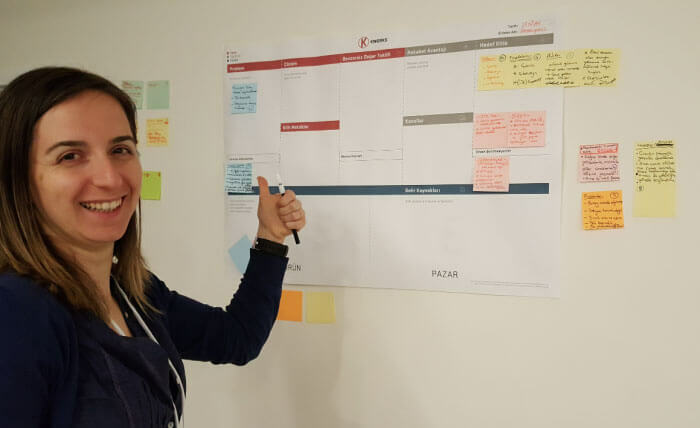 Before our online meeting on May13th, we target to increase the contribution of insights in the process by reaching to at least two more people out of a new customer group. We are a nominee for getting initial investment from this training program and the jury is on May26th. In a very limited time frame, we are insistent on getting a beneficial result for the economical sustainability of our 18 month old subject matter. As we walk with belief, getting mentor and expert support speed us up. KUSIF manages the project partnership of Change with Business with Vehbi Koç Foundation and UniCredit Foundation and Social Innovation Center (SİM) engages as content partner for Change with Business which is carried out with partnership of Yapı Kredi. One of the intermediary steps of this long running project had been the Impact Thinking Boot Camp, which we left with great benefit. For us, it was an efficient step that filled us with understanding and information on social impact and made us define new questions and challenges.